These fun rainbow crafts for kids are perfect to make for St. Patrick's Day, to celebrate the start of Spring, or for a colorful activity any time of year! Kids love rainbows because they are filled with colors. While these colorful crafts are perfect for St. Patrick's Day or to celebrate the start of Spring, these fun rainbow crafts for kids are really great to make any time of the year. From craft stick crafts to washi tape crafts, kids will have a ball making them all. This rainbow craft for kids uses craft sticks and is great to make for St. Patrick’s Day, spring, or pretty much any time of the year. If you have never done potato stamping before, you are missing out on tons of fun. Check out this awesome Rainbow Potato Printing Craft from I Heart Arts n Crafts and you will be hooked on potato stamping! What is better than rainbows and shamrocks? Rainbows and shamrocks together, of course! Kids will have fun making this easy St. Patrick’s Day Fingerprint Rainbow & Shamrocks craft. Talk about a throwback! Most moms can remember making this Fruit Loop Rainbow Craft when they were little, so you know your kids will love making this as much as you did. Red Ted’s Art Blog brings you this cool DIY Crayon Scratch Art Hearts Craft, using just a few materials, like crayons, white paint, cardstock and popsicle sticks. Artsy Momma brings you not one, but four cool rainbow crafts for your kids to make: Printable Pot-of-Gold Rainbow Puzzle, Printable Rainbow Number & Counting Matching Activity, Color by Number Rainbow and Fingerprint Rainbow. The little ones will just love this awesome 3D Over the Rainbow St. Patrick’s Day Craft. Where are all my washi tape lover at?! Use some of your washi tape stash up making this fun rainbow craft with the kiddies. This recycled art craft helps to teach the little ones about reusing and recycling as well as give them a fun and colorful crafts to make. I love paper plate crafts. They are always so easy to make, and often I find I have the materials right at home. Check out this fun paper plate rainbow craft which uses just paper plates, cotton balls, paper, glue and buttons. If you don't have buttons on hand you can always use colored paper or have the kids color the paper strips instead. There you have it – awesome rainbow craft ideas for the kids. I hope you found some terrific rainbow craft ideas to make with the little ones. Do you have a favorite rainbow crafts for kids? If so, we would love to hear about it in the comments below! These are such cheerful crafts for a gray day. Thank you for the ideas! I am going to use some of these. These are such cute ideas.I am always on the look out for crafts like this because I take care of some little ones quite often and these ideas come in handy. I love doing crafts with my granddaughters. The memories are outstanding! I have been doing crafts with my children since they were very little. Slowly my group added nieces and nephews and now I will be adding a grandchild. One of my favorite things to make with my children is and always has been rainbows ? or rainbows everything. 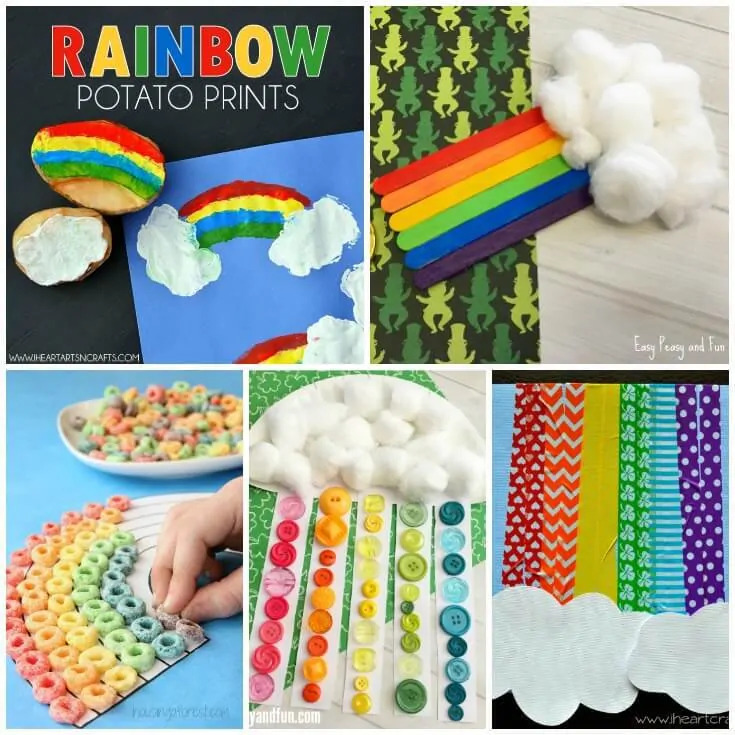 I love these ideas, especially the potato rainbow printing craft. 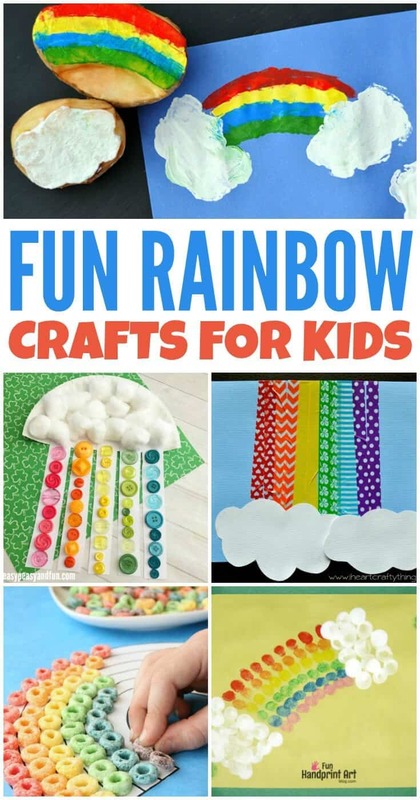 These are really cute rainbow crafts, Im sure my kids would love to make them! Thank you for all these fun rainbow crafts. They would brighten up any day and kids would enjoy them. Great ideas! I’ll use some in my aftercare program.